Yesterday, the National Labor Relations Board’s General Counsel’s office gave a boost to the SEIU’s $15 million-plus effort to unionize the fast food industry by backing SEIU’s outrageous legal theory on franchisees. On the one hand, it shouldn’t be surprising: General Counsel Richard Griffin is the controversial former general counsel of the International Union of Operating Engineers (IUOE), and his allegiances are still the same even if his job title isn’t. On the other hand, this decision by President Obama’s notoriously partisan NLRB is notable for its sheer audacity: Griffin’s decision eviscerates 35 years of legal precedent that has recognized franchisors and franchisees as separate. 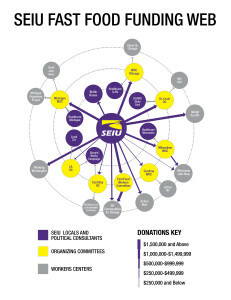 It is without a doubt the most significant development in the campaign by SEIU and its P.R. firm Berlin Rosen to hijack employer and employee rights. 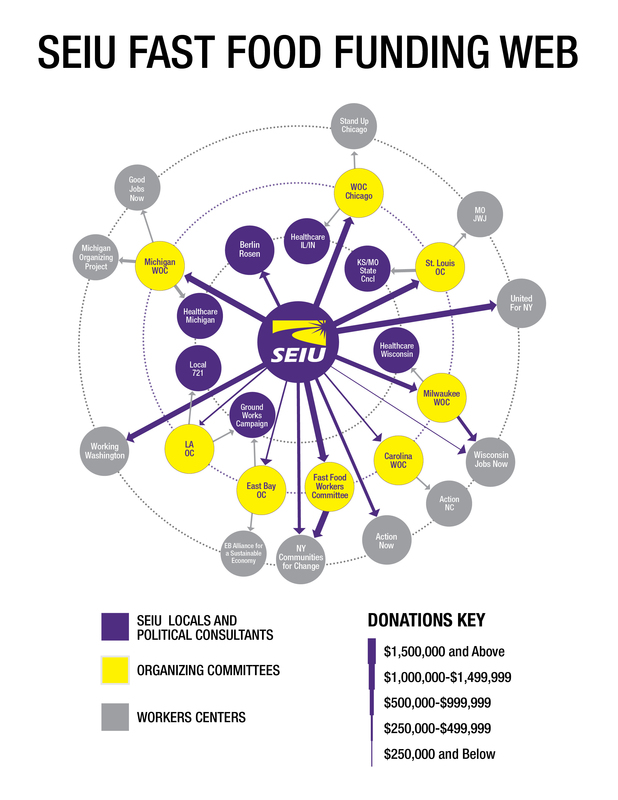 Here’s how SEIU’s scheme works. A stage-managed P.R. campaign purporting to show massive worker discontent despite little actual employee participation leads to the filing of NLRB charges (whether merited or not) against franchisees that rope in the branding franchisor companies. The partisan NLRB and General Counsel pursue the ridiculous legal avenue preferred by the SEIU and its lawyers Levy Ratner, P.C.—recipients of more than $4.25 million in 2013 from SEIU and its locals—despite over 30 years of appellate court precedent refuting the claim. The NLRB and courts have for decades recognized that two entities constitute a “joint-employer” under the National Labor Relations Act…if they share the ability to directly and immediately control or “co-determine” essential terms and conditions of employment, such as, hiring, firing, discipline, supervision and direction. That doesn’t sound anything like the relationship that currently exists between most franchisors and franchisees, where the latter directly control “hiring, firing, discipline, supervision, and direction.” Not surprisingly, McDonald’s has vowed to challenge Griffin’s decision, which seems ripe for a corrective from administrative law judges or federal courts.